Believe it or not, the bunch of Thai basil in the photo below is three or four weeks old (it’s been so long that I don’t remember). And yet it is almost as bright green and lush as it was on the day I bought it. 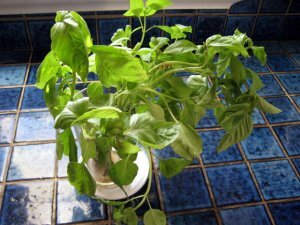 I don’t remember where I heard this tip, but since it works so well and it is basil season, it’s worth sharing.When you bring your basil home, trim the stems with a clipper, remove the rubber band or twist tie, and place the bunch in a glass or vase. Add a few inches of water to cover the base of the stems. Then take a plastic bag and cut a few holes in it (the fresh shiitake mushrooms I buy come in a bag with holes pre-made, so I often re-use them for this purpose). 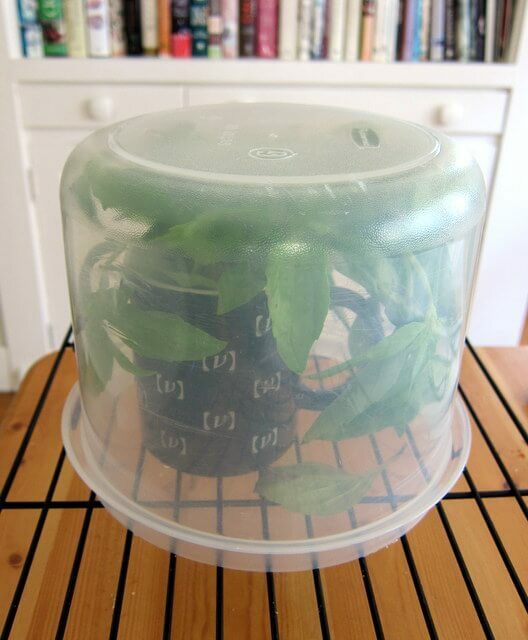 Place a plastic bag over the basil leaves and place the assembly in a well-lit location, but out of the direct sunlight. Check the water level daily and add more as needed. If all goes well roots will start sprouting from the basil, converting it into a pseudo-hydroponic system. The photo below shows how it looks at the end. 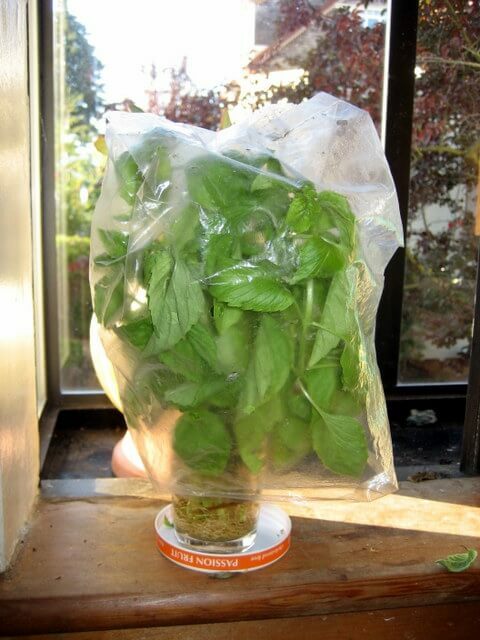 The plastic bag provides a moist environment for the basil leaves; the holes in the bag prevent too much moisture from building up (which can cause rotting); the water, although nutrient free, keeps the basil alive; and storage at room temperature allows the plant to function normally. Another example of the success of this method: a bunch of basil that I finished last weekend had been on my counter for at least six weeks. The plastic bag method described above is a little messy and unruly, so I have been thinking about alternative methods. One Saturday in July, one came to me: use a large container and set the entire thing onto a cooling rack to allow air circulation. An example is shown below. After trimming the basil stems, I put them in a mug with some water. I set that on a cooling rack, and then put a large plastic container over it all. It worked — the basil stayed fresh for several weeks. Awesome tip, thanks for sharing it! One question though: How do you keep from using it all before it has a time to grow? Got that same hint from one of my favorite organic farmers last week at the farmer’s market. Thanks for posting the pics! I’m hoping mine will make it as long as yours! We did this, minus the bag, and the bunch lasted so long we finally planted it in the ground. We figured that if it was hardy enough to thrive without soil that it would be just fine in the earth. It’s actually doing pretty well! Brilliant brillant! I have been test driving all kinds of methods this summer and only getting as much as 6 days. I will try this out, thanks! I am so glad I found this tip late last week before being handed an enormous bunch of basil from a friend’s garden. Now I don’t have to turn it all into pesto before I lose most of it. Thanks! Works great for asparagus (in the fridge), too! Wow. Does this work for other herbs? I love fresh cilantro more than my own mother, but hate buying new batches constantly…. I will have to give it a try. Thanks! Thanks everyone for the kind words. I’m sure my idea has been in books before, but for me it was just one of those “light bulb” moments. sarah c. asked how I keep my herbs around for a few weeks. It’s hard to say. One reason is that I’m always buying too many vegetables at the Farmers Market (“Sure, I’ll add a bunch of basil to my order.”). Another is that my cooking attention span can be limited, so if I think about cooking Thai one moment, I might switch to Mexican the next. Monica — that’s a very good question, one for which I do not know the answer. For some reason I have never tried it with cilantro or any other herb (I have a reasonably well-stocked herb garden that contains most of the herbs I like to use. But not cilantro, which I can’t grow.). Perhaps I’ll try it this week. Hi there. Great Job! I am starting a Commercial Organic Aquaponics Fish farm myself. If you get a chance check out Hydroponics and Hydroponics blog. thanks for the tip but does the basil have to have roots already? or is it just cut off? It doesn’t need to have the roots already — they will sprout from the cut end of the plant after a few days. Very interesting tip! I just spoiled a whole bag of basil after a few days. I think I put too much water. I'll try the bag thing too. I know this post is like 3 years old but I found it when looking to save my basil, thanks so much! Going to try this today! Never miss a post: enter your email address to subscribe to this blog (addresses will not be used for other purposes).